As part of the 2015 hennemusic Rock News Awards, the site is counting down the Top 10 Rock News Artists of the year. The weekly show sees Hagar count down lists of his favorite party songs, comeback albums, unsung heroes or best tunes from a specific year or decade. In May, Hagar and Metallica frontman James Hetfield hosted the second annual "Acoustic-4-A-Cure" benefit concert in San Francisco, CA, with proceeds going to the Pediatric Cancer Program at UCSF Benioff Children's Hospital. The package captures the band in concert last year performing hits from Hagar’s 4 Decades Of Rock show as well as classic tracks from the Led Zeppelin catalog. Hagar previewed the set with a pair of Van Halen tracks – “Poundcake” and “When It’s Love” – and it went on to debut on the US Billboard 200 at No. 78 with opening week sales of 7,000 copies. The Red Rocker made major headlines by continuing his war of words against his former band Van Halen by slamming their latest effort, “Tokyo Dome Live In Concert”, just a week after its release and then responding to a shot by David Lee Roth following the group’s performance opening the 2015 Billboard Music Awards. The war raged into June when Hagar claimed that the Van Halen brothers - Alex and Eddie – are trying to prevent him from performing songs from the band’s Van Hagar-era. Hagar then stepped up to support Anthony from slams by Eddie Van Halen while promoting the band’s live album, calling the guitarist “a liar” for claiming that he had to show Anthony how to play his parts before heading out on tour. In August, Hagar announced plans to launch Sammy's Island, a lifestyle brand presenting home products influenced by his two favorite vacation spots – Cabo and Maui. September brought the release of “Are We Having Any Fun Yet? The Cooking & Partying Handbook”, a project that sees Hagar sharing his passion for food and his secrets for entertaining while revealing his favorite recipes from home and on the road. 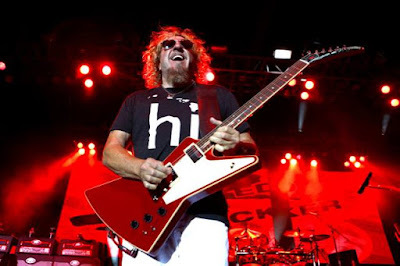 Hagar marked his 68th birthday in October with his annual series of shows in Cabo San Lucas, Mexico, and then was joined by guitarist Johnson to perform Van Halen's 1991 classic, “Right Now”, during a special halftime performance at the San Francisco 49ers home game on October 22. The singer will launch "Sammy Hagar's Rock 'n Roll Road Trip" on AXS TV in January. The series sees Hagar travelling the States to hook up for interviews and jams with fellow rockers including members of Motley Crue, the Grateful Dead, Heart, Alice In Chains and others.